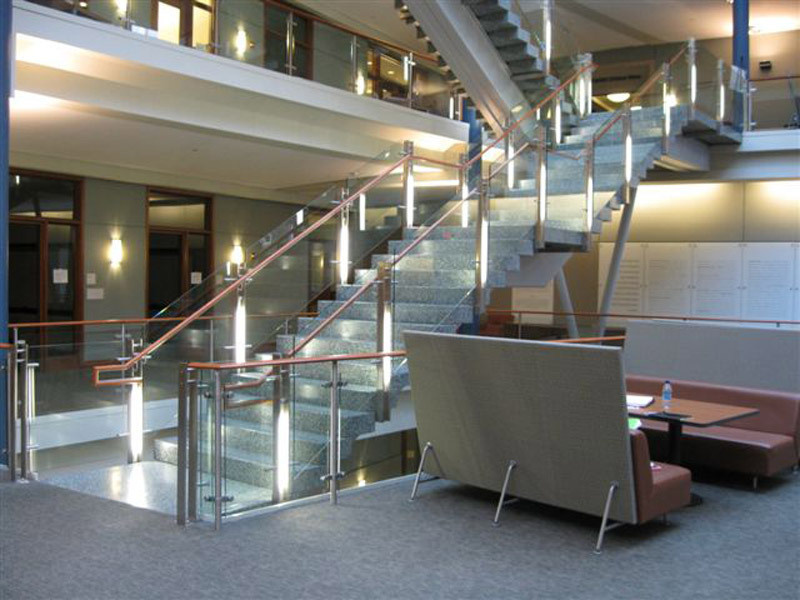 Ornamental Stairways | Tate Ornamental, Inc.
We have designed and fabricated freestanding stairs and supported stairs. 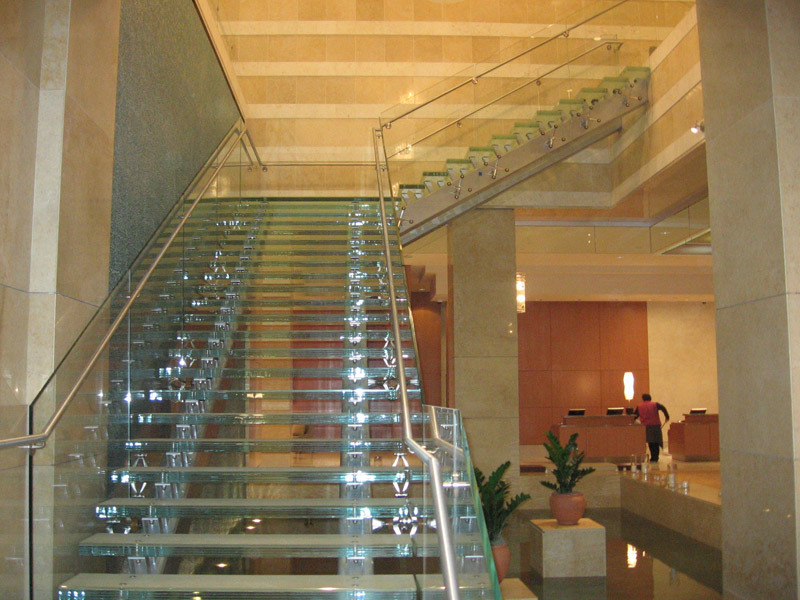 We produce all of the work in our facility and transport using our own fleet. 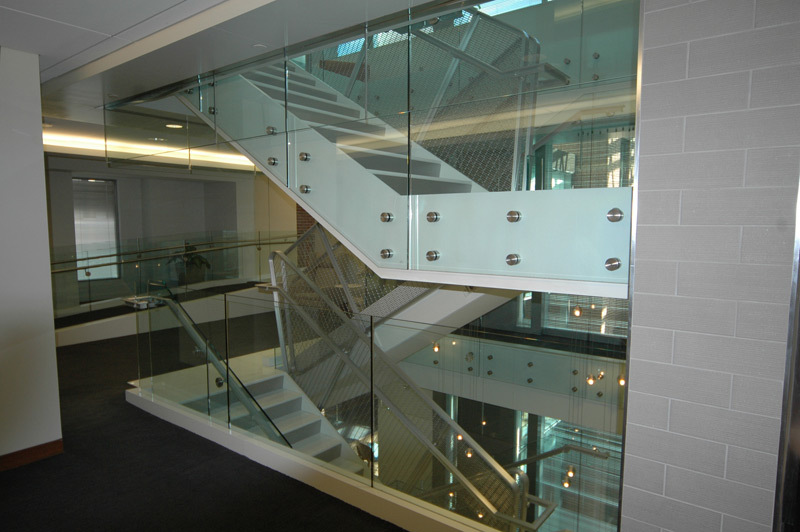 Tate Ornamental has been involved in a number of unique and complicated projects including installing stairs on the 15th floor of a building by flying the finished product through a window 170 feet off the ground. 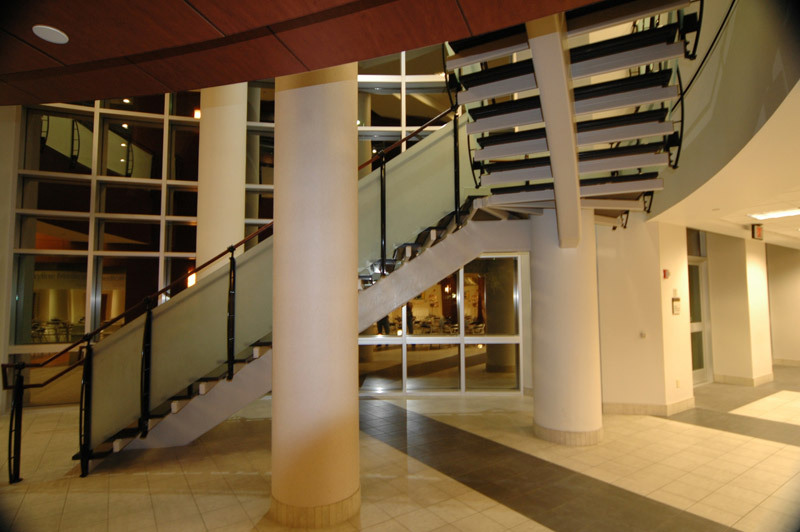 This monolithic stringer stair includes column supports at the landings and includes granite treads. 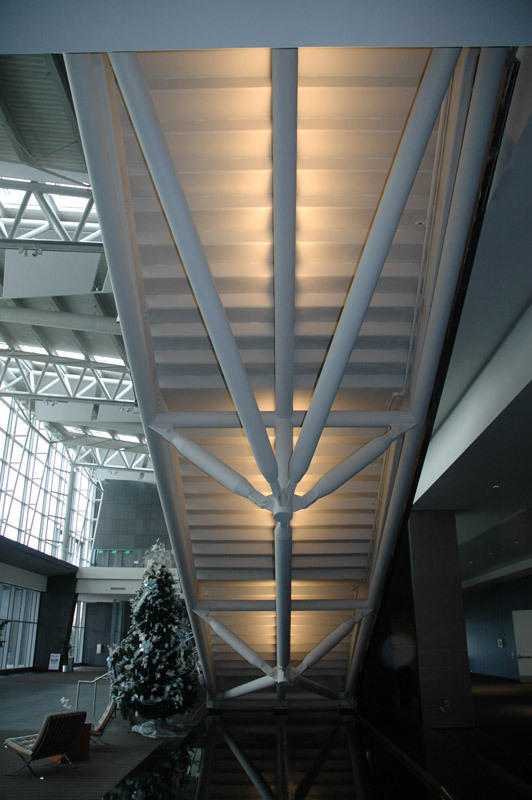 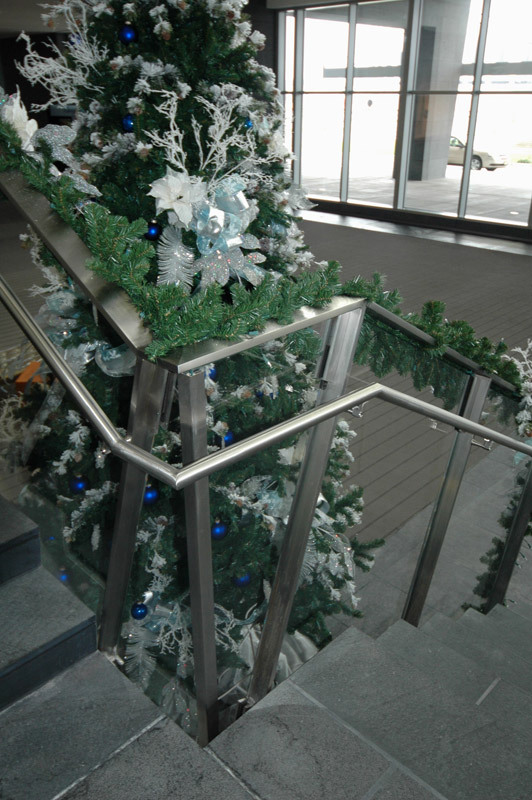 The stair features stainless steel lighted handrail posts supported by custom outriggers that attached to the stringer. 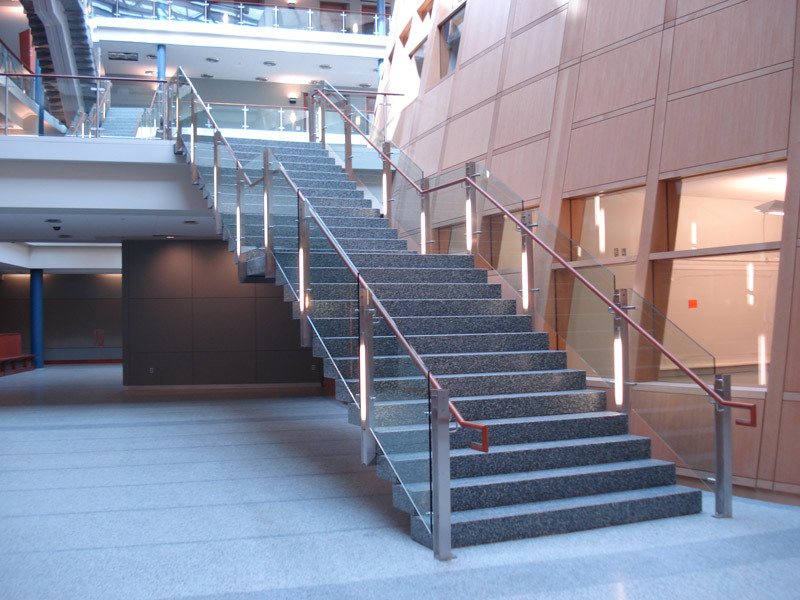 The stair is complemented with a wood grab rail. 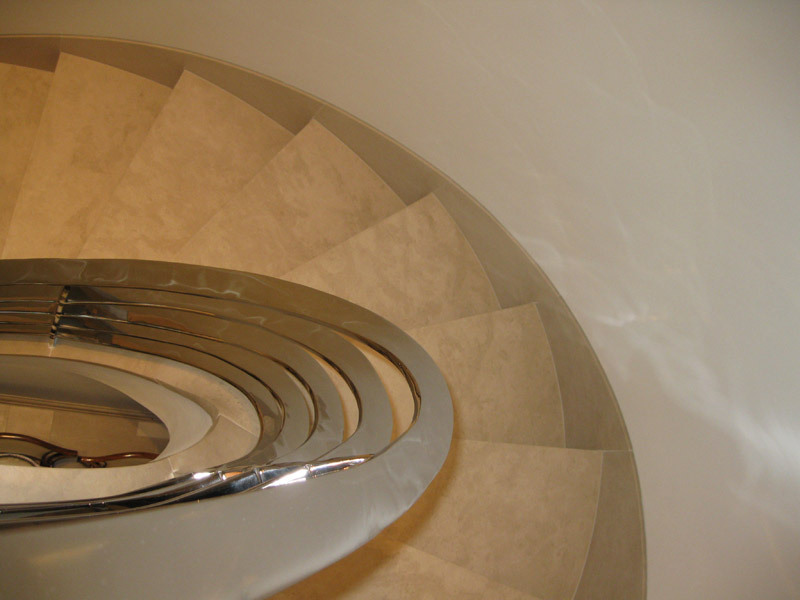 With this project, we have an elliptical stair made from steel plate with steel pans and risers covering the travertine. 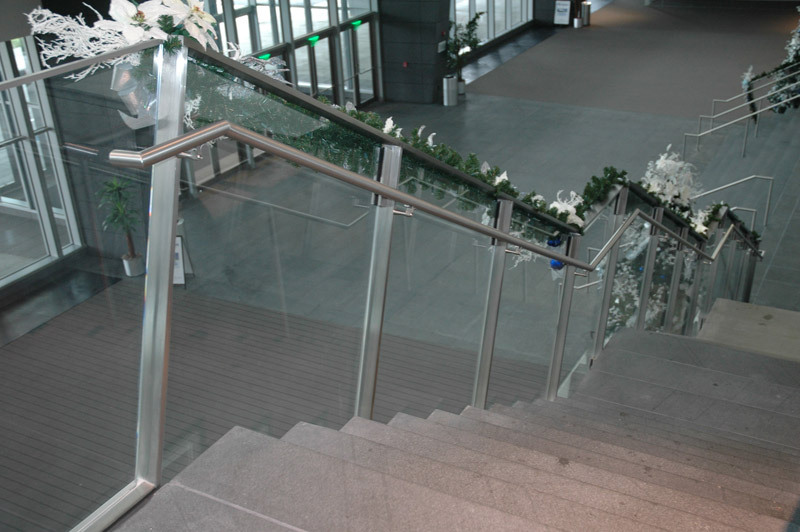 The handrail is a very difficult five line mirror finished solid stainless steel flat bar rail system that includes welded and mirrored polished joints. 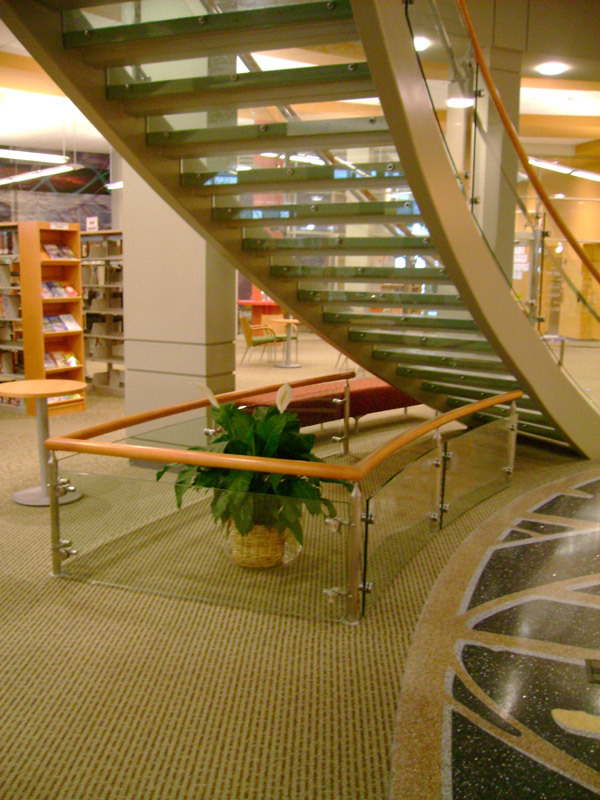 This particular rail is very difficult to keep flat while rolling, but Tate Ornamental’s craftsmen along with innovative technology were able to create an amazing product. 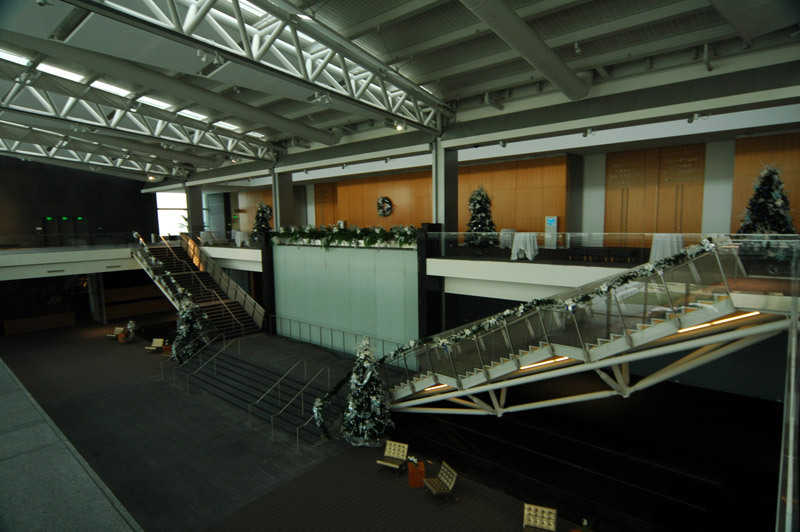 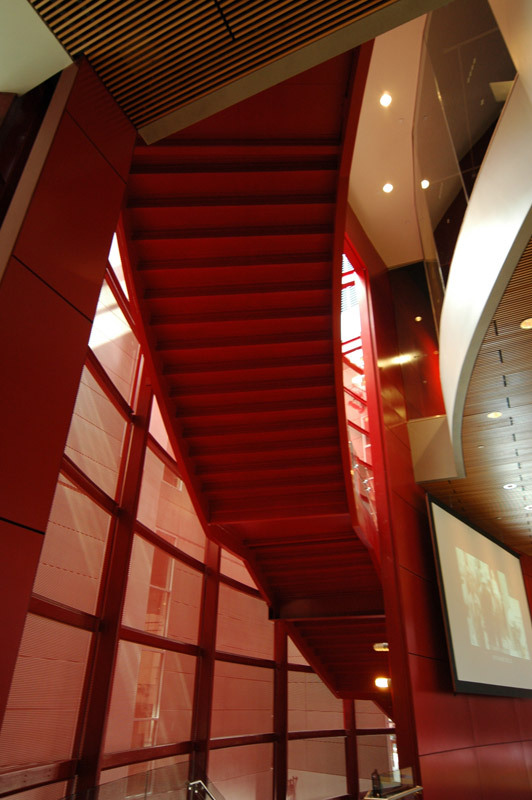 This project includes two 10′ wide straight painted steel stairs made with three stringers, two landings, and a very unique architectural support underneath the stair to make the stair act as a truss. 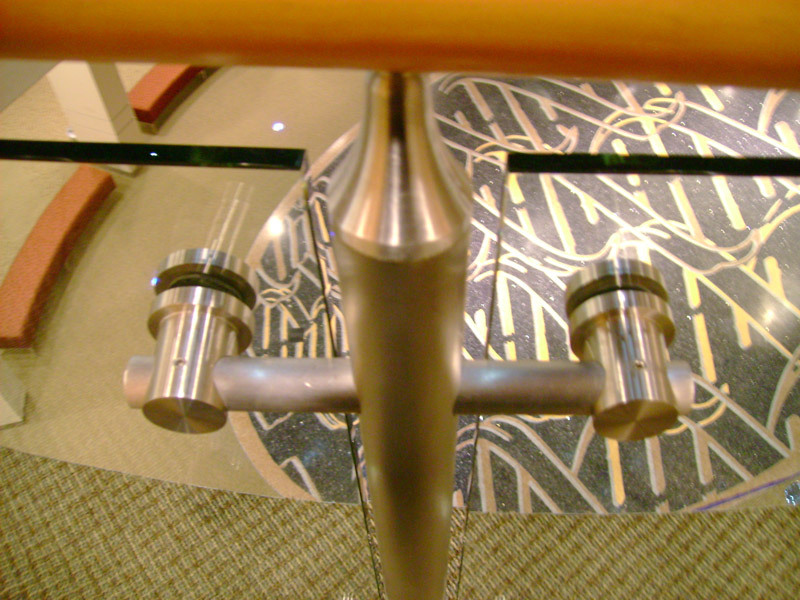 The knuckle connection underneath the stair was custom cut and machined to accomplish the finished detail. 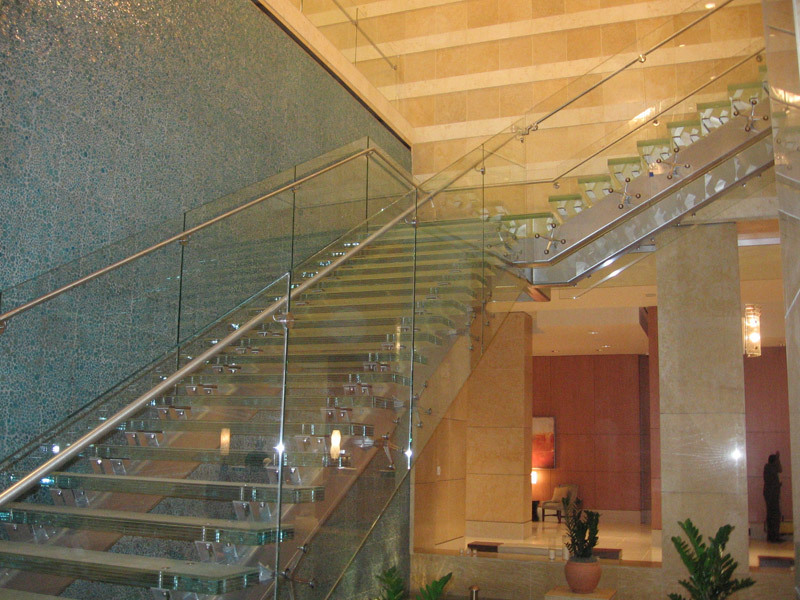 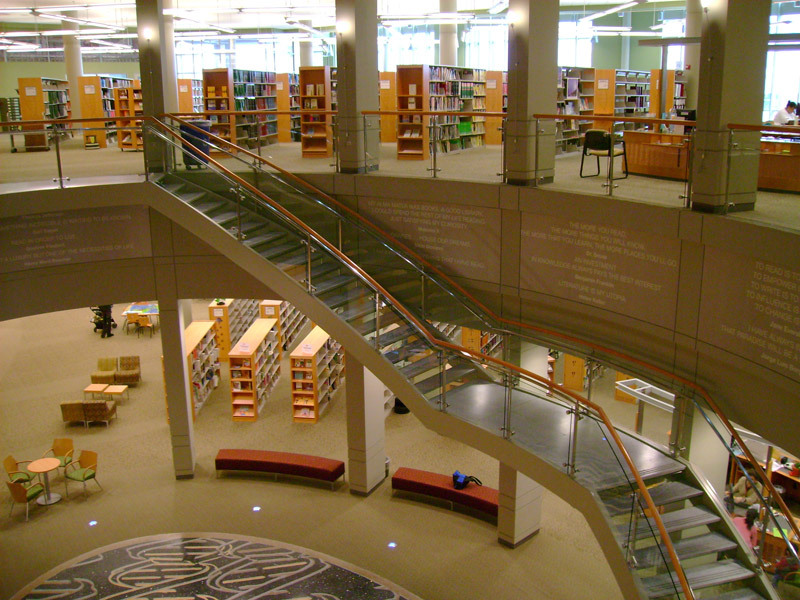 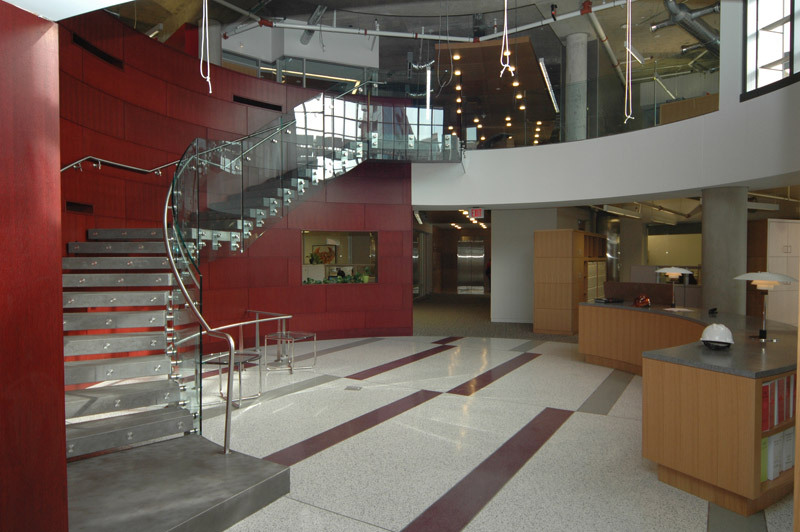 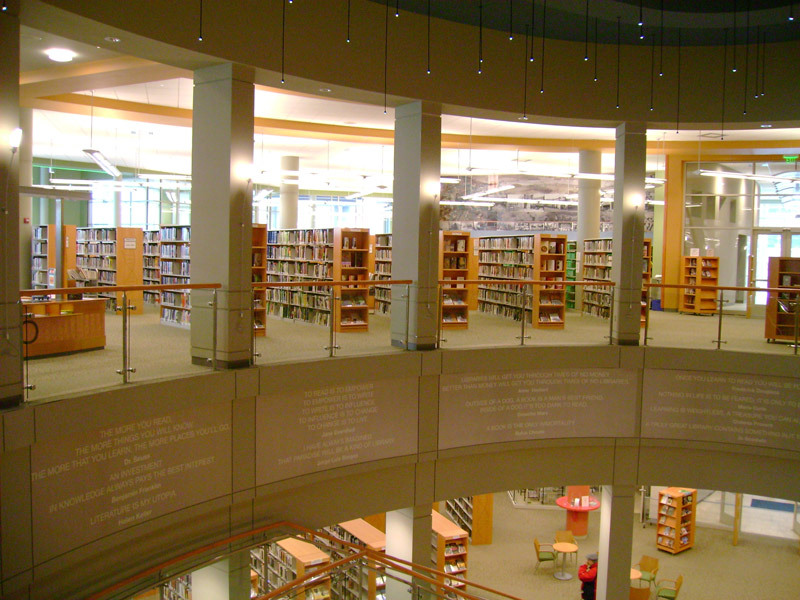 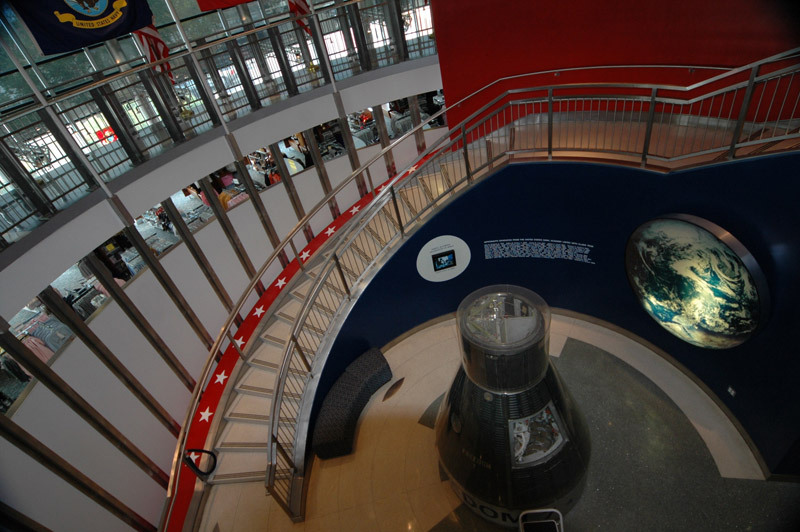 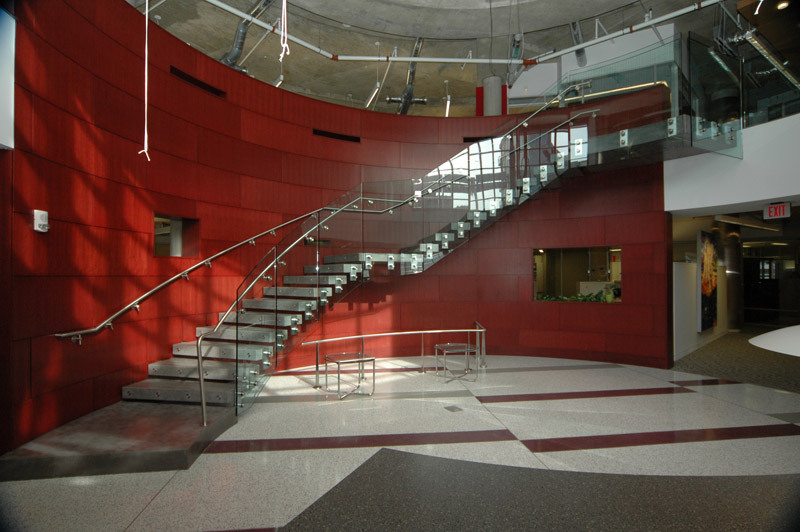 The architect designed three unique handrails for the stairs which included a stainless steel post and top cap with GKD wire mesh fabric in-fill panels on the interior, a decorative post, and a half inch tempered glass in-fill panel system on the balcony side and a one line stainless steel rail down the middle. 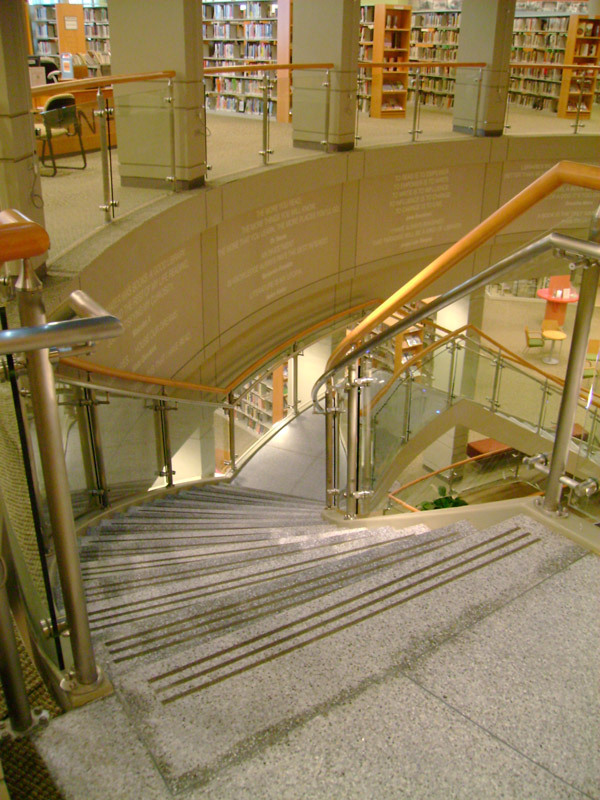 The granite treads are supported by custom made steel supports welded off to the three stringers. 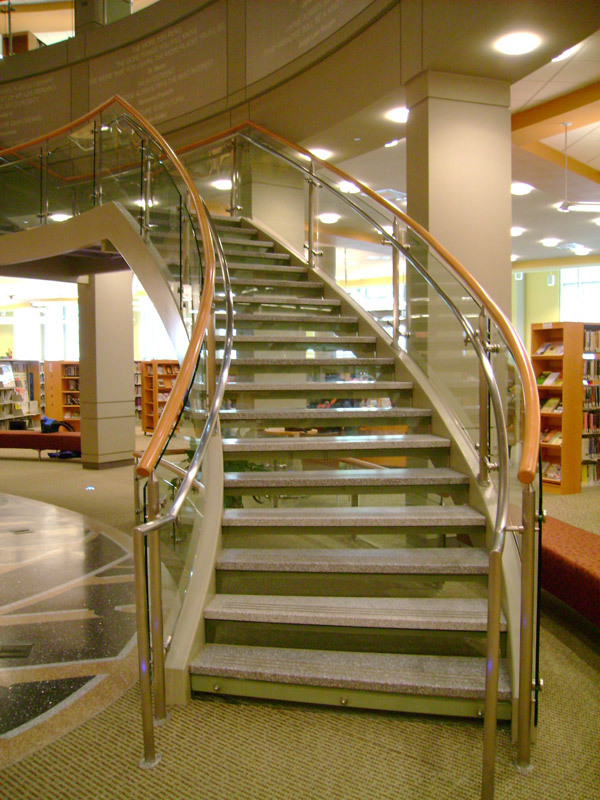 This painted steel spiral stair project includes stone treads, glass risers, wood top cap and stainless steel posts mounted to the tube stringer. 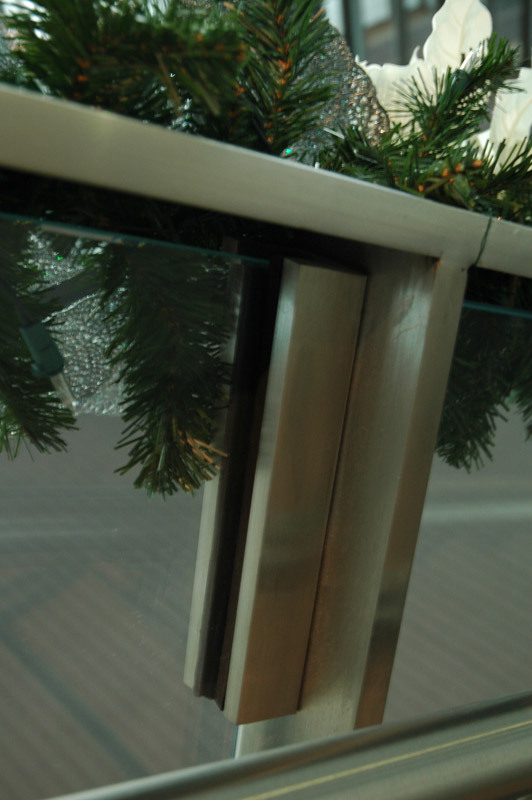 It is a post system with spiral tempered glass attached to the post with custom stainless steel fittings. 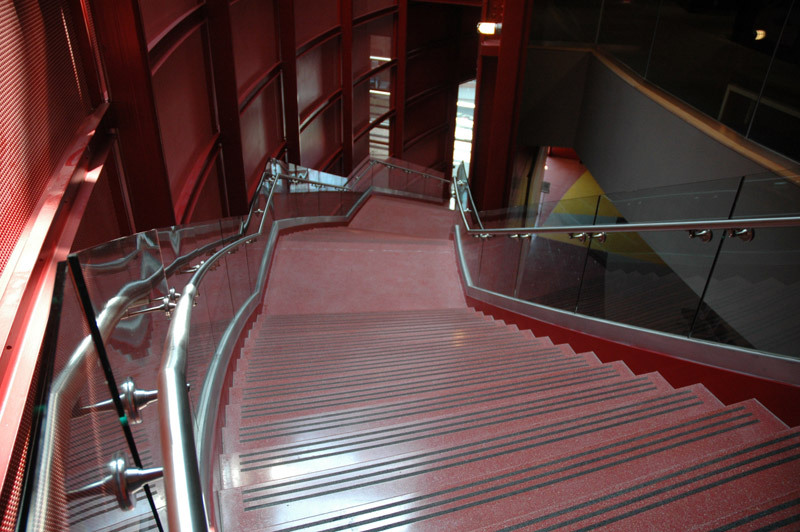 This stair is unsupported and free standing. 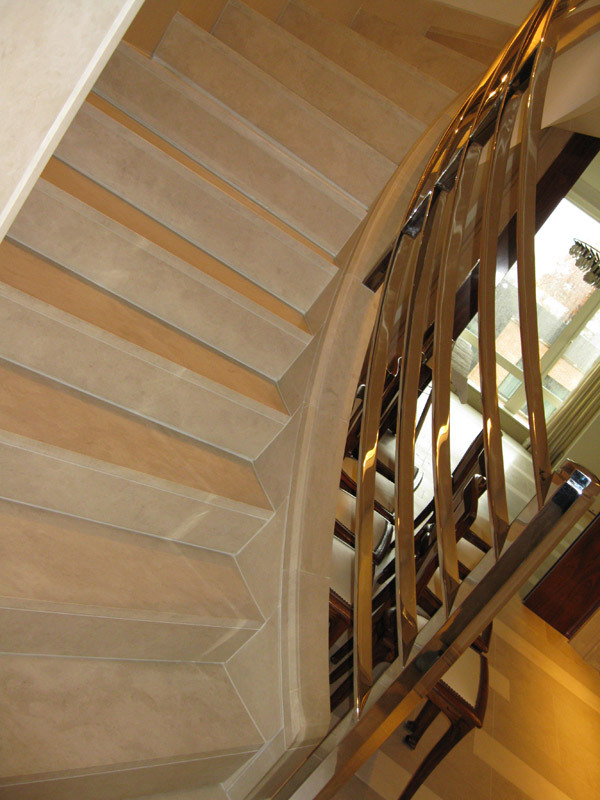 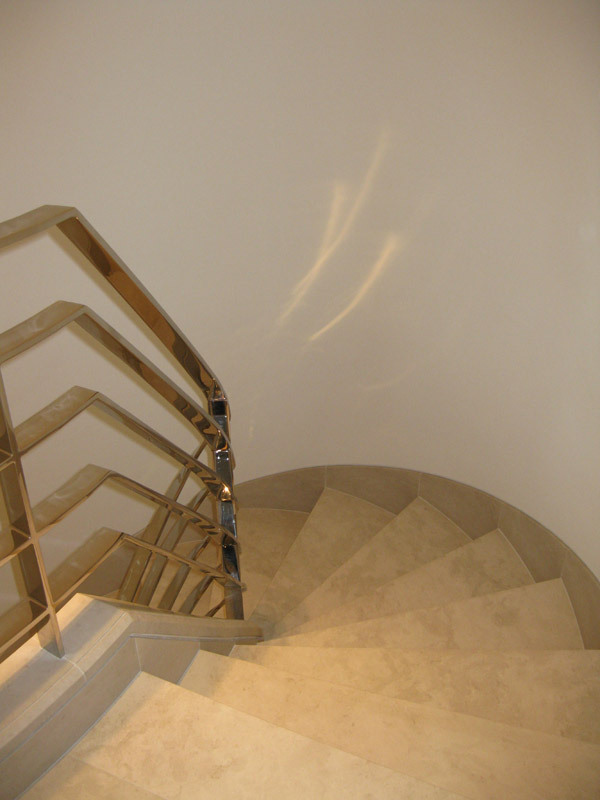 This stair is a single stringer staircase supported with a column at the landing and steel outrigger supports underneath the granite treads supporting the granite to avoid breakage. 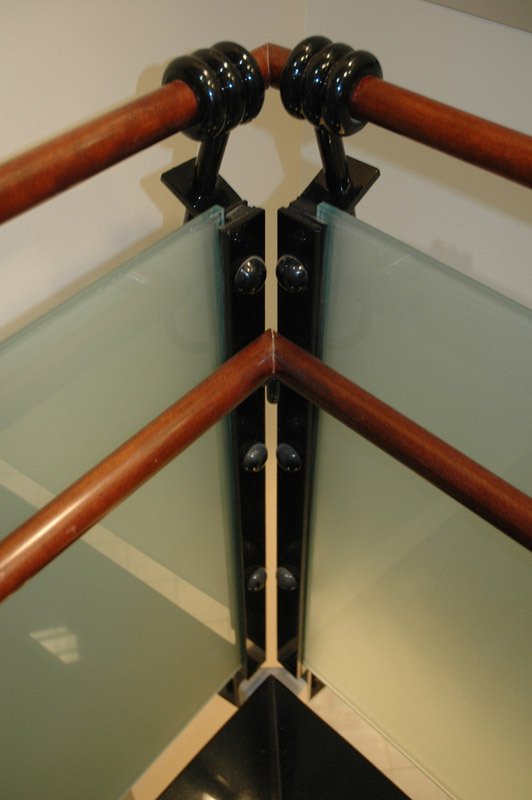 The handrail is a custom fabricated post and collar with frosted glass held in place by a button head rivet. 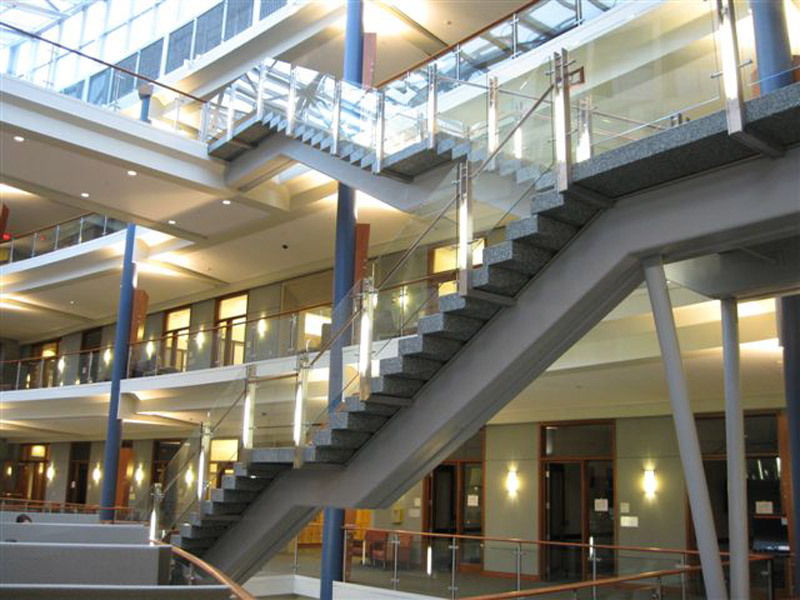 This stair also includes stained grade wood top caps and guard rails. 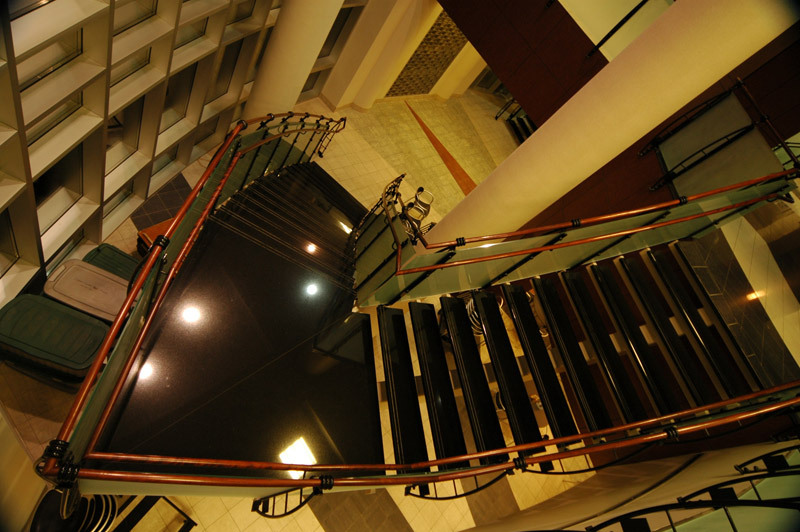 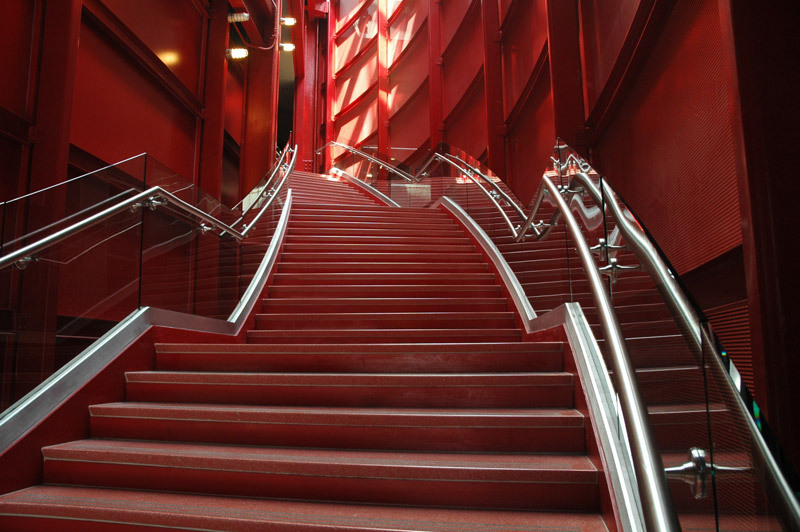 This multi-level, free-standing, monumental staircase is built using half-inch steel plates. 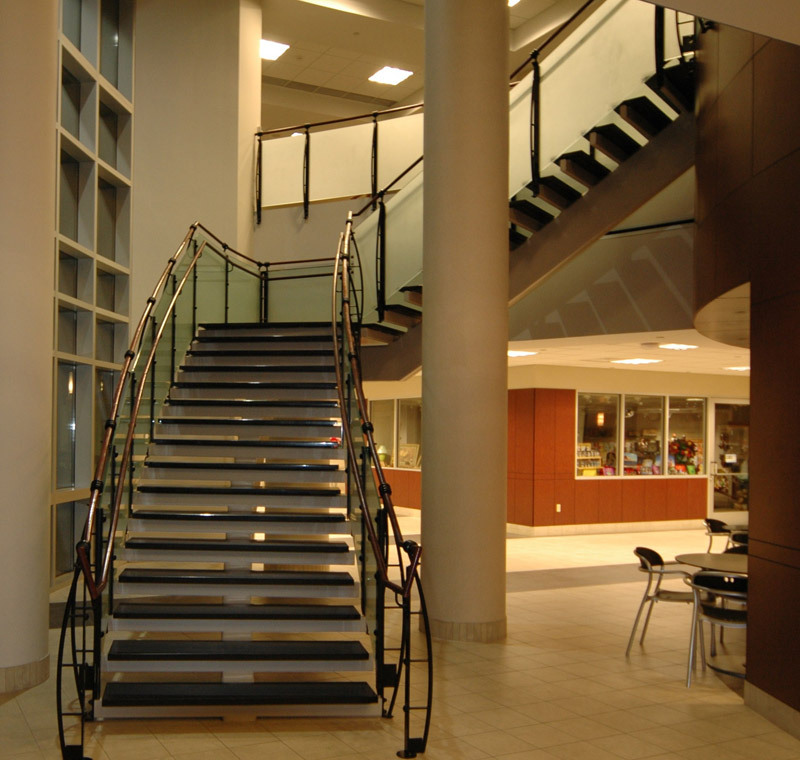 The circular staircase is oversized and offers extra wide stairs, two landings in the middle of the stairs, the half inch plate is rolled and formed to make a 20″x8″ box stringer. 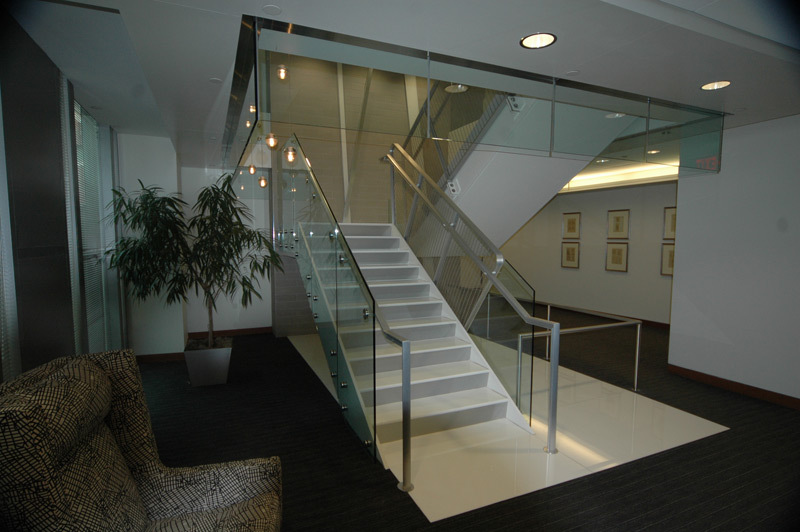 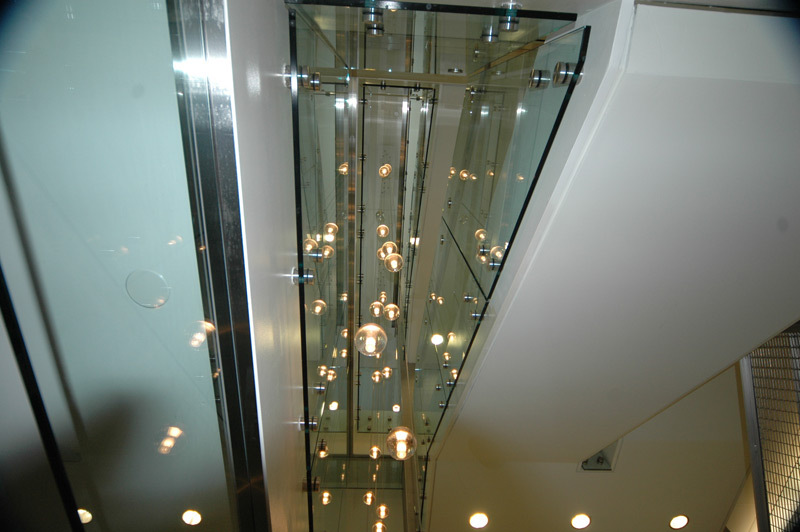 The stair is capped off with a beautiful stainless steel grab rail mounted to an exposed polished glass guard rail with no top cap. 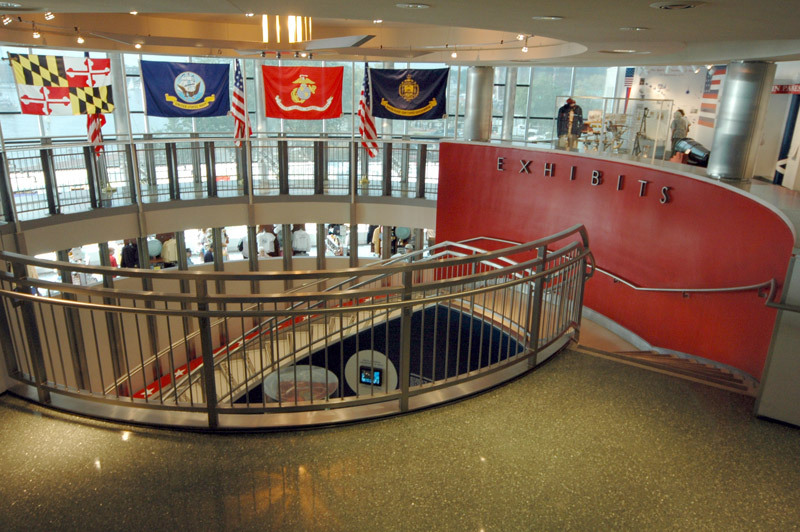 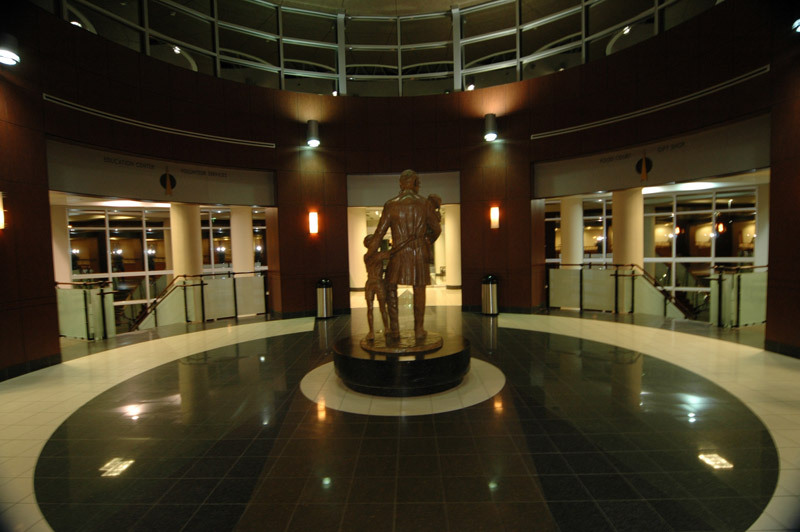 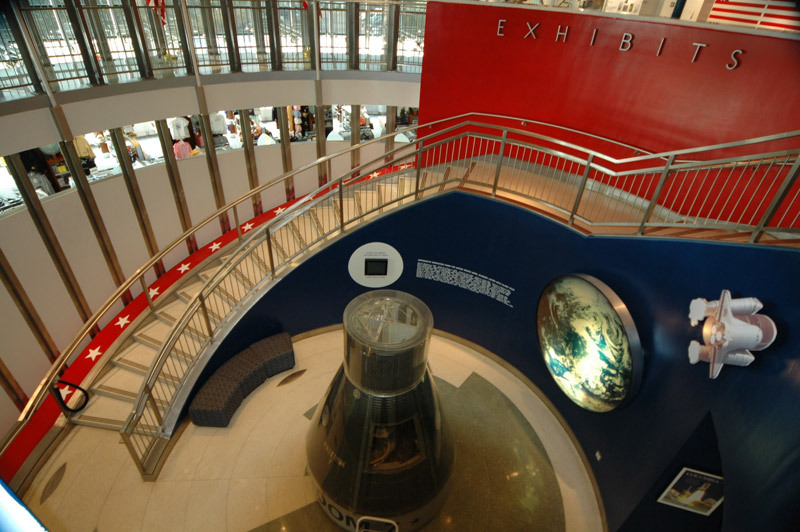 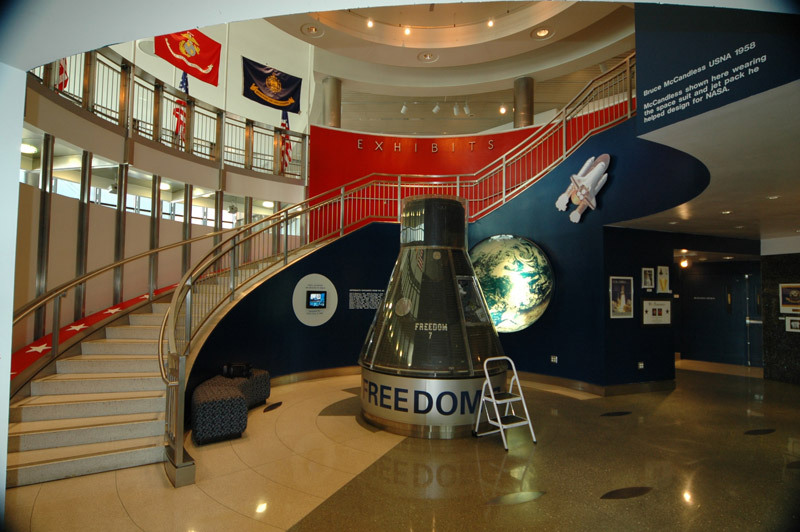 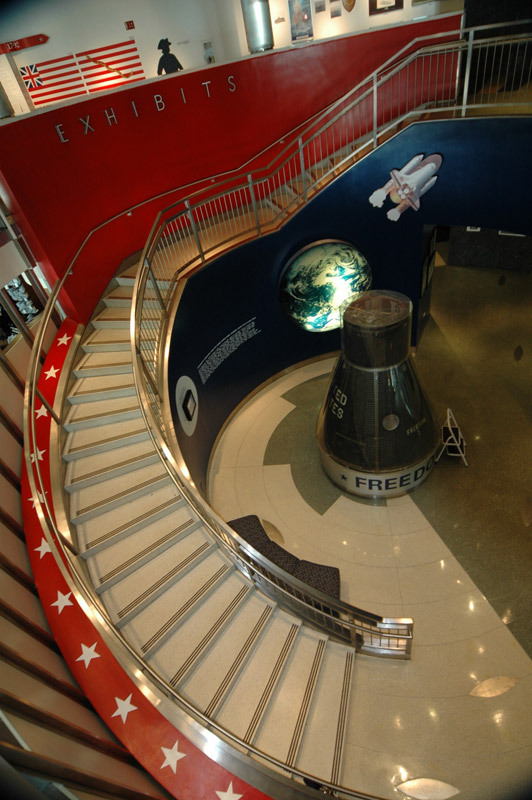 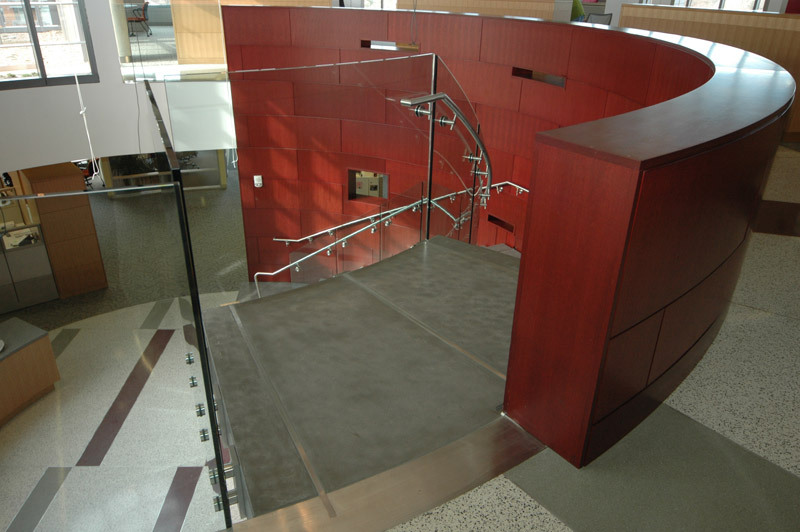 This circular stair offers a support wall below to exhibit artwork. 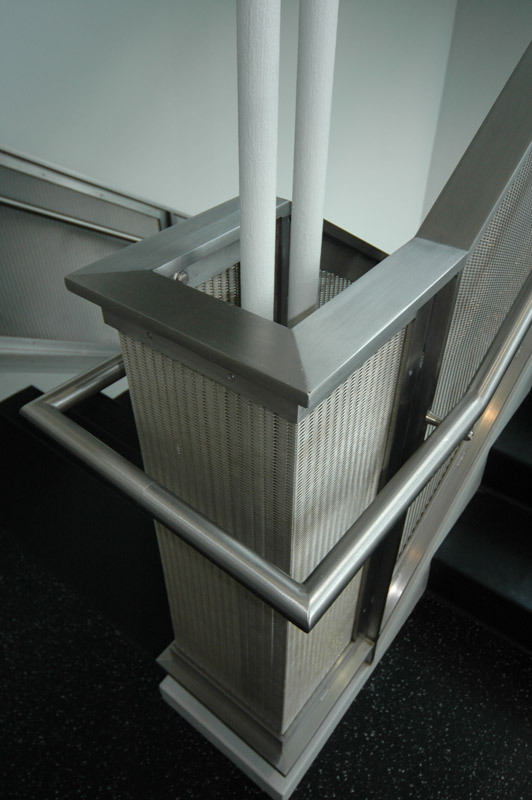 We used stainless steel hand and guard rails with stainless steel picket in-fill panels and architectural fin posts fabricated using a water jetting technique. 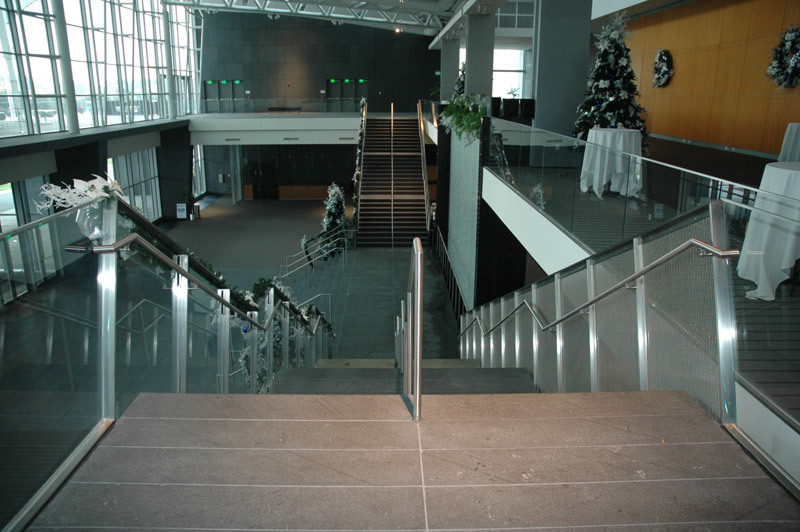 This is a very unique monumental stair made with precast concrete treads supported through the wall by concealed structural steel supports and is non-supported. 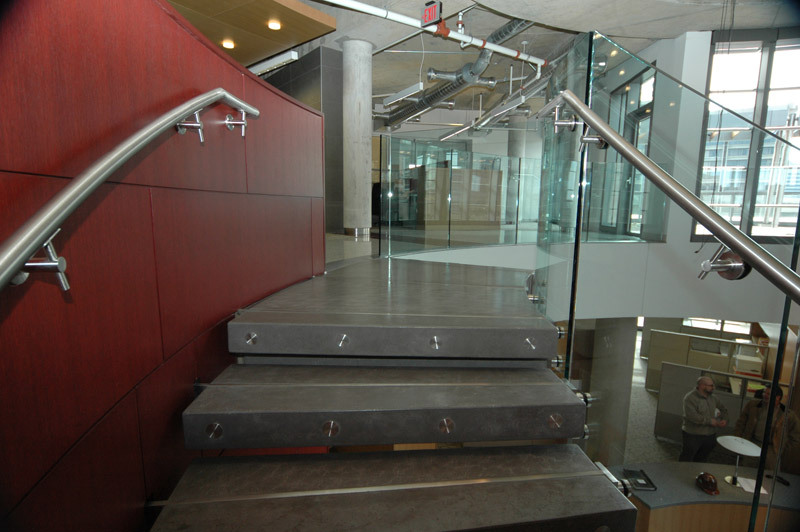 The rail is stainless steel, half inch tempered glass and precast concrete treads. 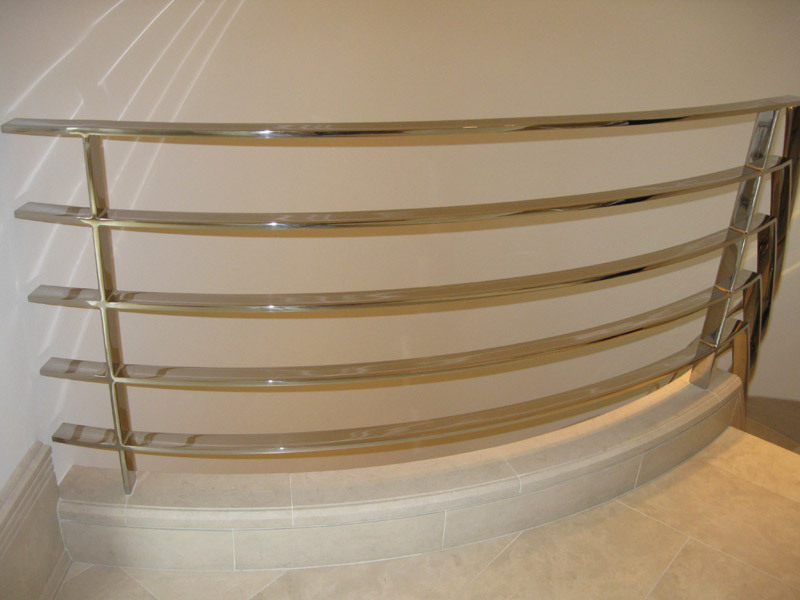 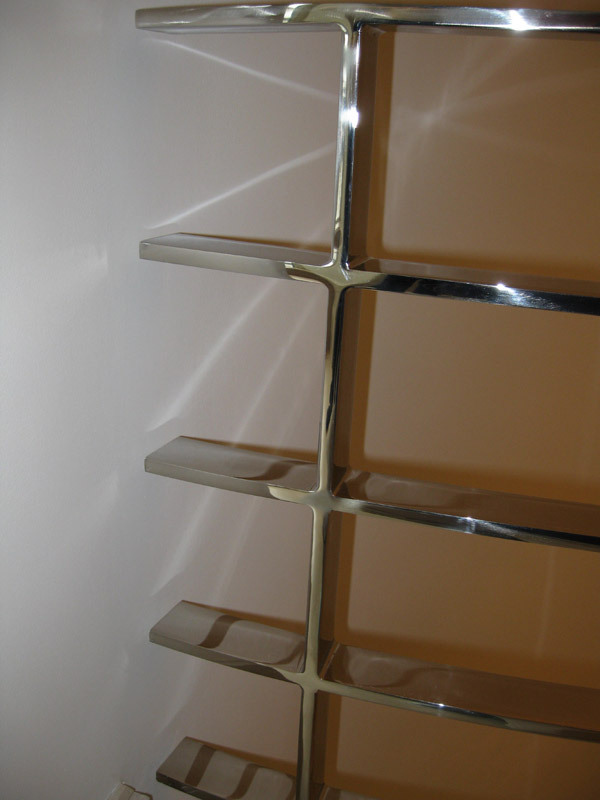 The stainless steel rail has welded joints that have been made into a satin #4 finish. 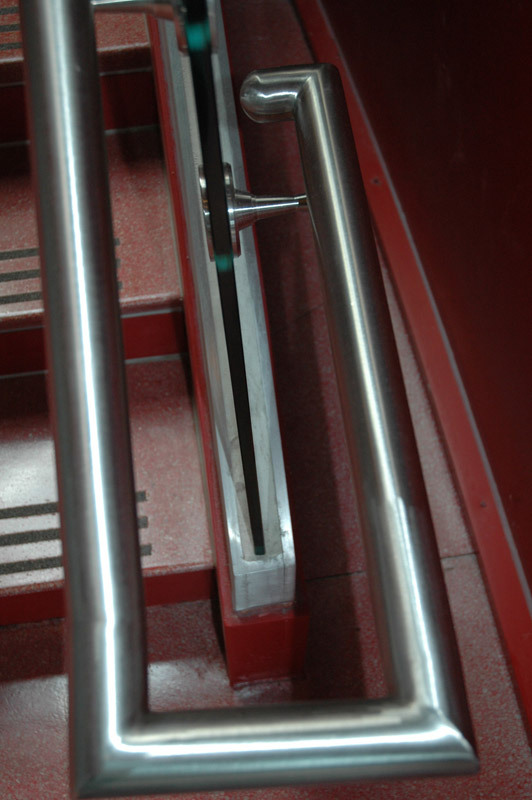 A stainless steel cane rail is placed underneath the stair for safety. 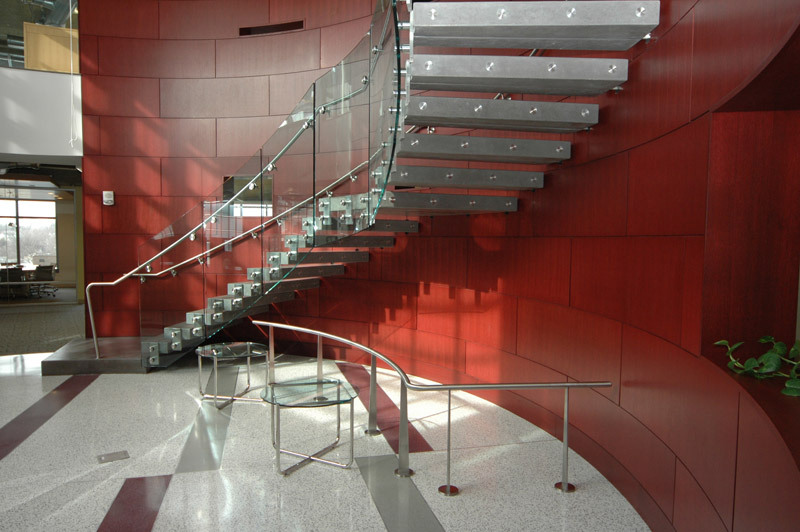 This monumental stair is fabricated with two exposed structural steel stringers that have been finish painted. 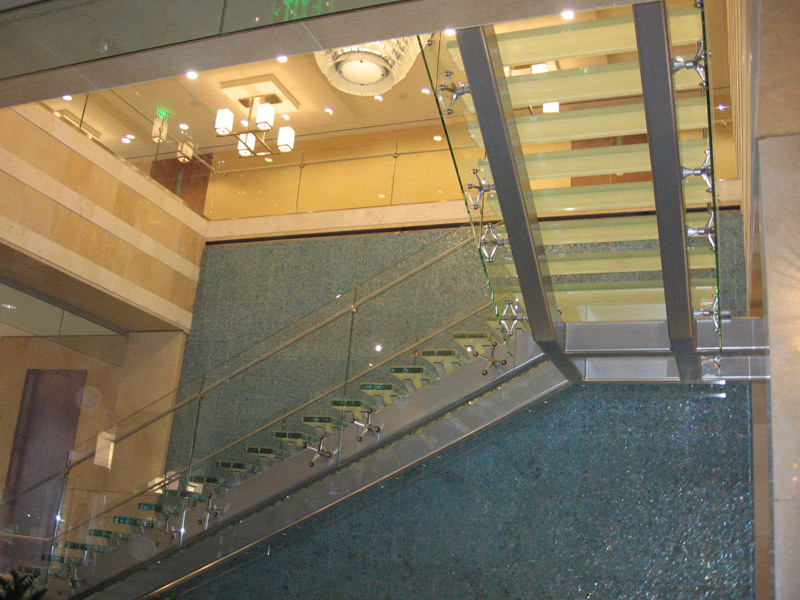 The treads are three-inch thick laminated glass with half-inch tempered glass guard rails attached to the stringers with stainless steel spider fittings. 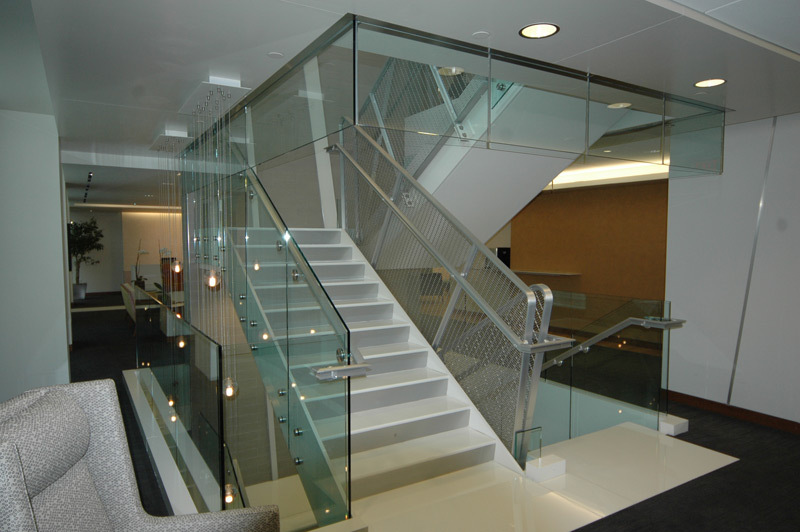 The hand rail is stainless steel with a #4 satin linear finish and attached to the glass with custom made stainless brackets. 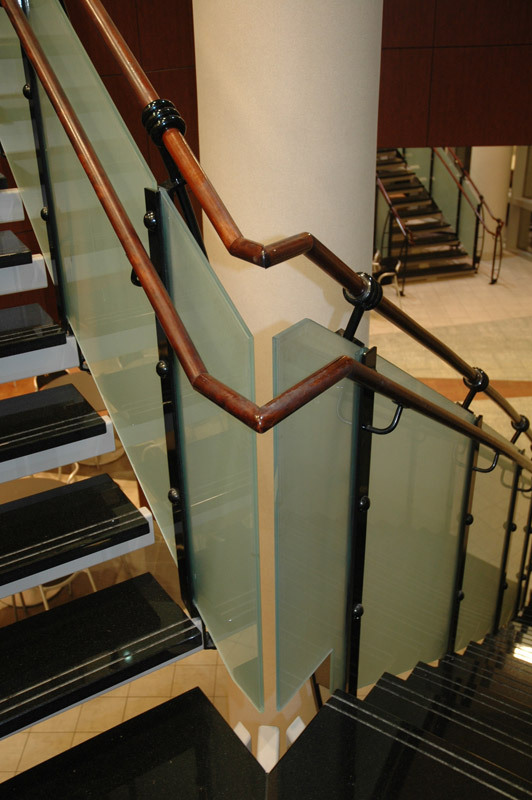 We used the utmost attention to detail fabricating this stair and rail. 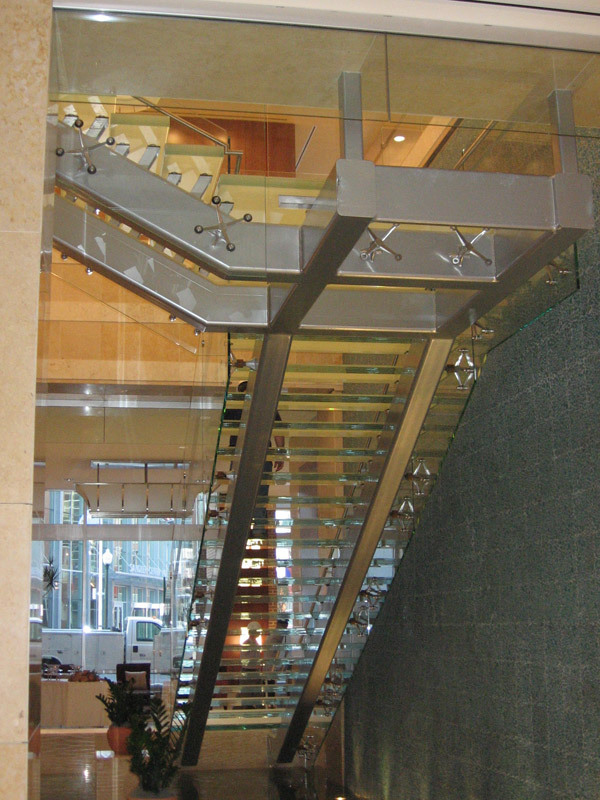 We ensured that all of the joints were fully welded and finished, and that the tempered glass rail panels were polished and mounted so that all of the polished edges were exposed. 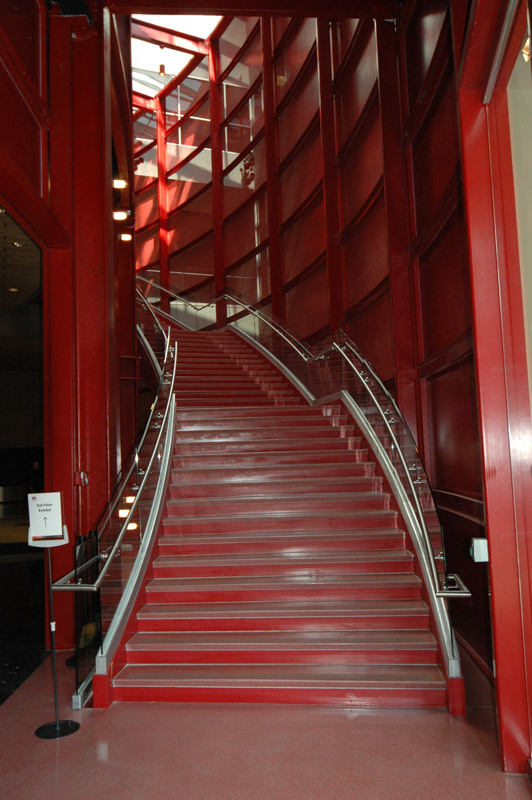 This monumental stair is very unique. 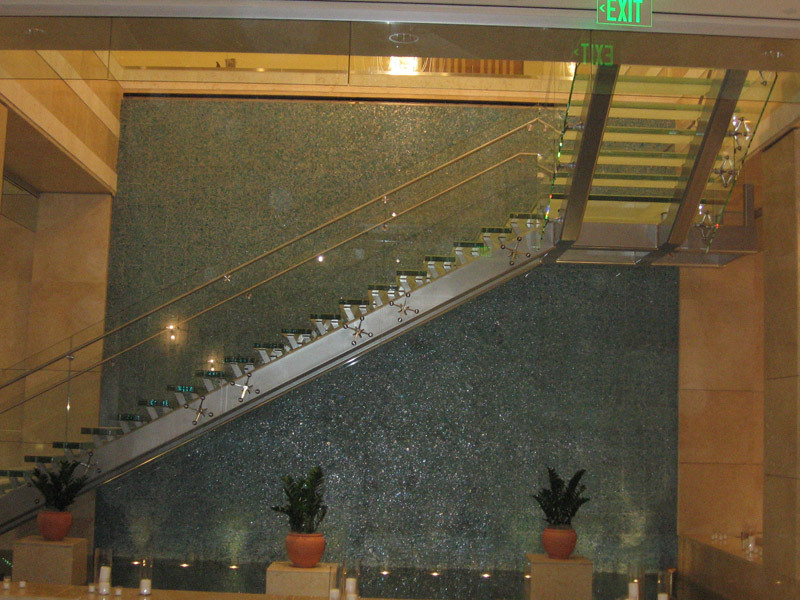 The owner wanted a stair going from floors 6-8 so the employees did not have to use the elevator throughout the day. 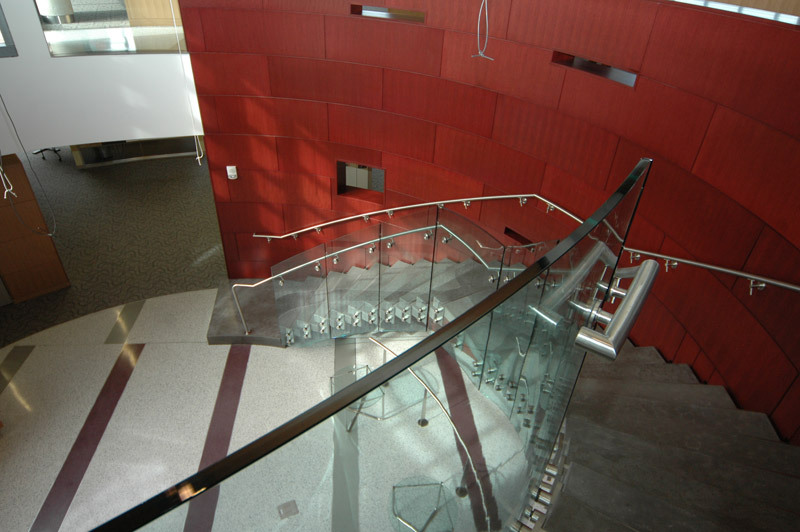 In order to not disturb daily traffic in the office building, Tate flew the stairs through the 8th-floor window using a crane. 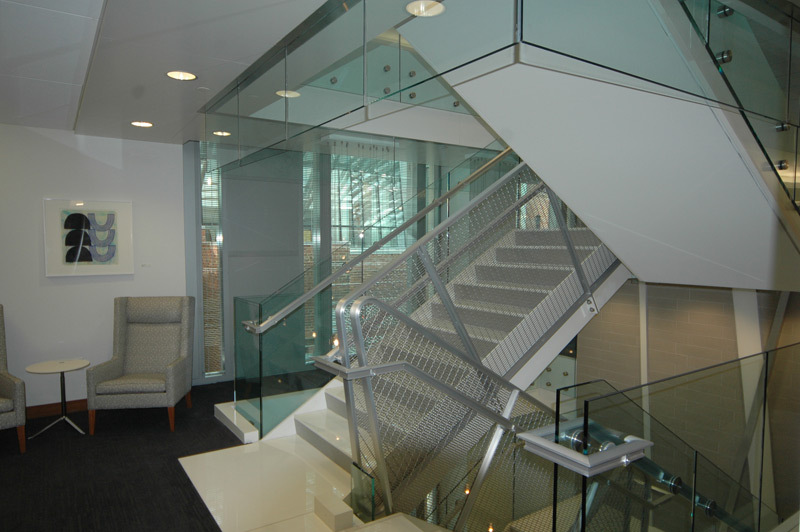 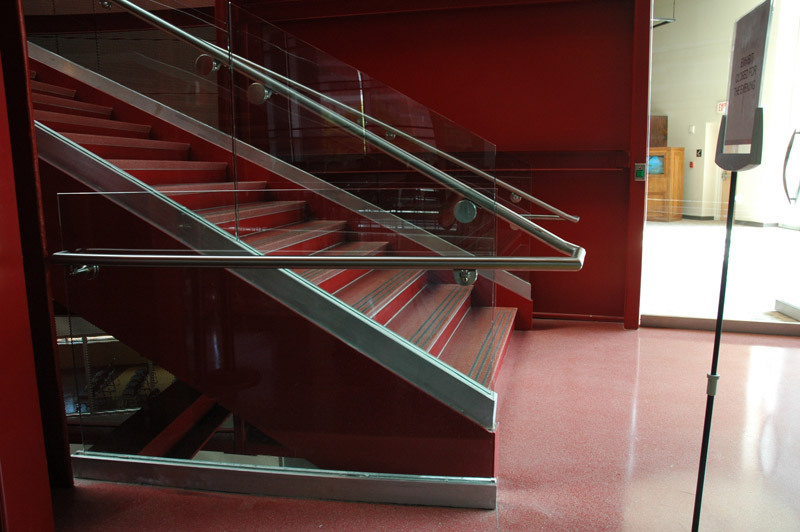 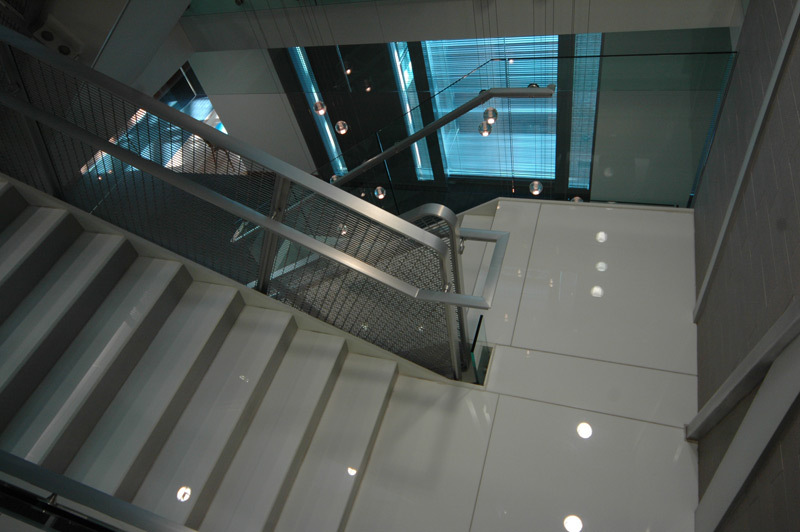 We installed the stair as well as the clear powder coated aluminum and glass railing system. 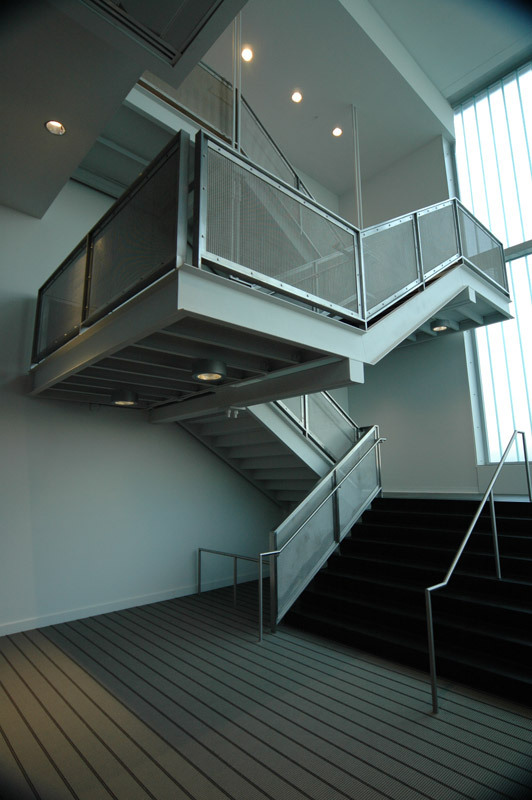 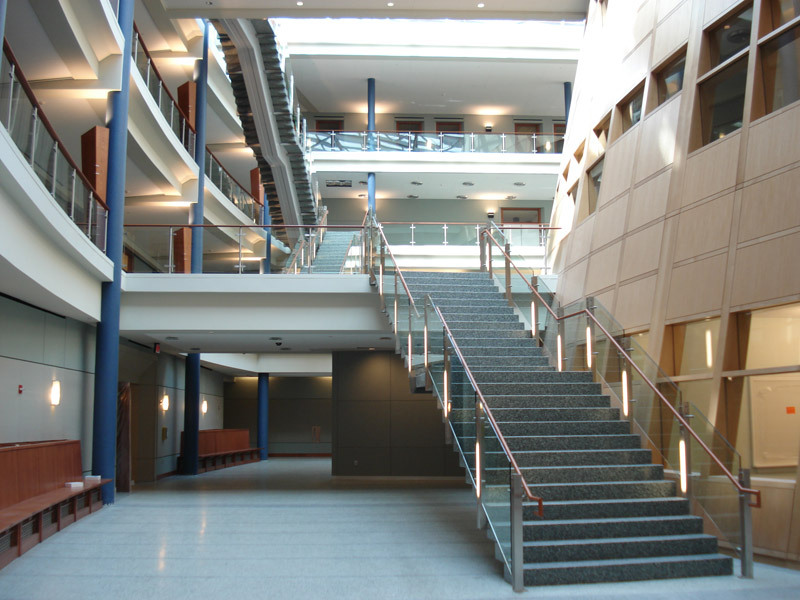 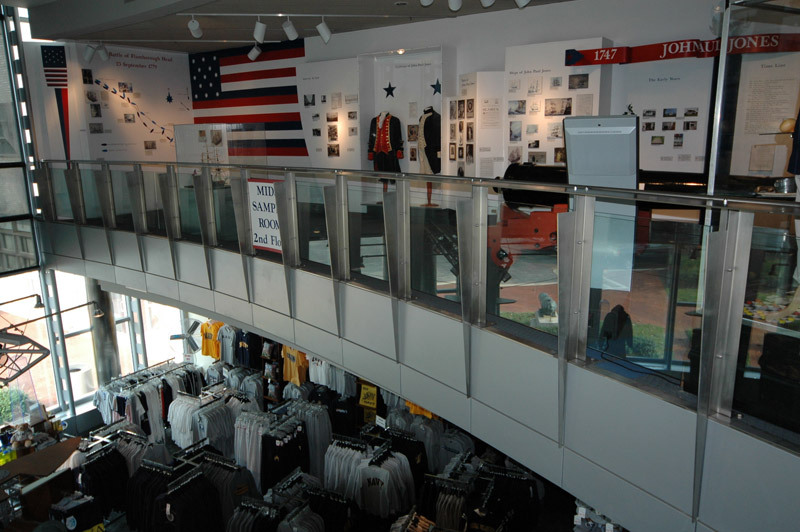 It consisted of 5/8″ tempered glass rail on the exterior of the stair and clear powder coated aluminum rail with aluminum wire mesh infill panels on the inside of the stair. 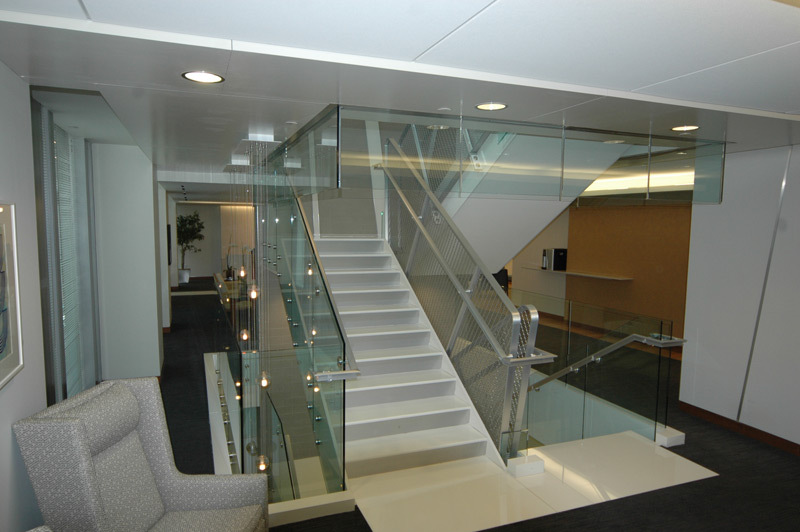 Tate also supplied the smoke baffle as well as the glass handrail system around the openings.